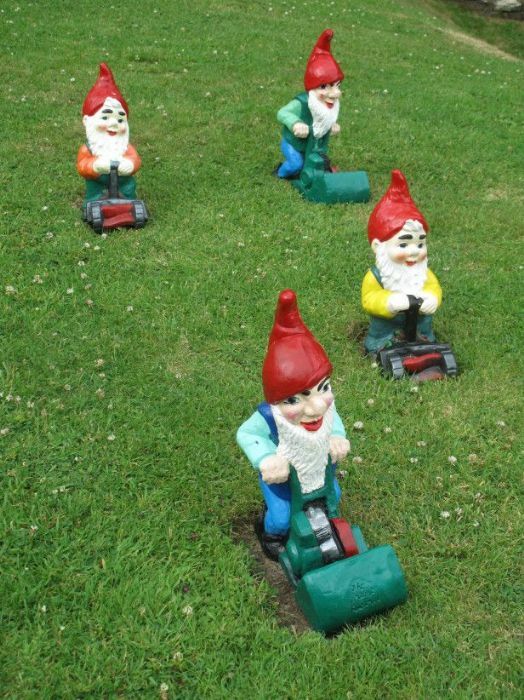 Gnomes make great house pets....and if you teach them how to do lawn maintenance even better! sheep poo is easier to deal with than Texas Land Mines though, jus' sayin' is all. Bear, I took the plung about 20 years ago, bought this place for $40K , was still working call outs for G.E. , then got lucky and landed the Job at Exxon-Moble in Port Allen (Baton Rouge) that was an hour and 15 min. drive each way ... was there for 7 years then we lost the contract. now Im back on call outs with Archrock...Since then I also bought the north property thats attached to mine !! I thought I would not make it at first, but with a few sacrifices here and there along the way, I made it.... and it feels great to come home to my own place....Remember, you can never go wrong with owning land !!!! Congrats on your purchase Bud !!!!! Get two cats, birth litter mates if you can. They will be great hunters, friends, and at times when they play it is great fun to watch. Canuck, I was wondering when the gnomes were going to be mentioned. Shamu, you do have a pretty good point there. Rhino, thanks for the encouragement. I am pretty excited now looking forward to being king of my own castle, so to speak. I am sure I will get used to the commute in no time. Best part is once I get a home office set up the company I work for is good about letting people work from home when the weather is bad. Paddy, that is exactly what I plan to do. I know I will have a vermin problem at first as the house has been sitting empty a couple years so a couple of cats should help that issue. "king of my own castle"...I cant wait to see the drawbridge yer gonna make! ..and a moat!! Gotta have a moat, with a moat-monster!! Oh no a Hoadie in the moat! I just use a mule and Guinea hens as a walking patrol. Actually...TURKEYS..They are the best weed eaters & security systems you could possibly have. Seriously. Found that out @ my buddy's place. He put some turkeys out round his place in Niagara Falls. They ate every weed in sight - on a continual basis. Absolutley nobody or anything could approach the property without them makin a huge loud fuss. (& they really clean up the june bugs, too!) Makes fer some darn fine eatin, as well. I will post some pictures next time I get over there. At this point it won't be until after the first of the year, but I won't forget. Did you forget the photos Bear? congrat's on our first "tax" bill! be assured it won't be the last! but that sounds like a good deal; I wish it was as cheap here. I have not forgotten I just have not been over to the house yet this year. It will probably be a couple weeks yet before I run over. I promise to take some pictures when I do. Do they test missles there? It's just in the middle of nowhere. Very old house (part of the house is the original claim shanty) so it's assessed pretty low. out in the boonies...where the Aliens can getcha!! Best have an Enfield at the ready with lots of ammunition! I've learnt loads since we bought our house. It's still not finished and it'll be 12 years this May since we bought it. That also means the end of the mortgage! which should free up some cash to help finish it. Work rate slowed when my daughter was born. The only advice I will give Bear is always aim to do a good quality job. Do it right so you won't be re-doing it in a couple of years. There is a "time versus money" equation with house projects. The less money you have, the longer it's gonna take; as I've found out! Never go New York style! "If there's time to do it there's time to do it over"! I appreciate all the advice, Lord knows I need it. I am really looking forward to this move and hopefully it will be my last move. We rebuilt an old farmers cottage in South Wales literally from the walls up. 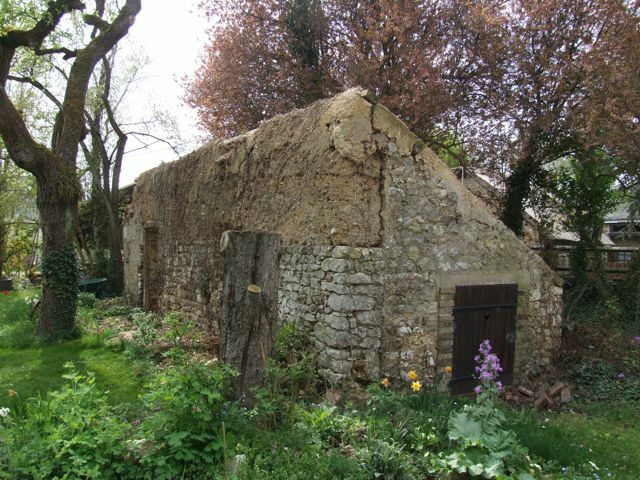 It had been abandoned for almost 100 years & we had just the dry stone walls. It helps to have 30 something members of a club, not just for the labor, but for the diversity of skills. It was a rewarding experience, a feeling of putting down roots for a change. Being in a very rural area you acquire unique (& daft) memories, like the morning I woke up craving coffee after a boozy night the The Lamb (pub so old revolutionaries from the welsh succession were hidden & captured there) & there was no milk. I looked out the back window & there was a field of (dairy) cows! Brilliant! we were om good terms with the farmer. So I took my mug of coffee, waded through the stream, climbed the bank scaled the fence & milked a cow into the mug for just enough. I figured I'd tell the farmer that night & pay for it then somehow! Well I walked in the door of the pub & the whole place burst out laughing. Turns out the farmer'd been watching wondering what the heck I was doing! He'd never seen a cow milked into a coffee mug before! Well, y'kow - you think different when you drink.. I usually find the opposite, I drink differently if I think! No, it is the land undiscovered by snowflakes. Well, things are on the move.... Waiting for the lawyer to finish the contract for deed papers. Move in time is the end of April. Just got a car for commuting to work yesterday. Got a decent deal on a 2006 Pontiac Grand Prix. Everything is coming together nicely. I will be moving a few things over next weekend so I will take some pictures then. Congratulations. Having your own piece of the planet is a great feeling. Plant a tree to celebrate. This is the view from the top of the road, the cottage is a bit lower down in the trees. If you have google earth look for "Halt Rd, Penderyn", or Google 50° 45' 10.68"N X 3° 32' 51.07" W. Beautiful scenery. The the train scenes from the movie "Young Winston" was filmed on top of the escarpment in the background. All the "natives" & Boers", were striking Welsh Coal Miners in blackface! Many of my Welsh (mis)adventures, were in this area. Bear: Once your in on the farm..plant chickens! You'll get eggs AND meat! Who hit the bottle early this morning then? Possum, the other white meat! I would like to have livestock of any sort but that won't be for quite some time. I travel too much with my job to make it feasible. well, get a herd of cats, then. They'll keep the vermin at bay. In the winter, you can grow snow! (for export). I'm sure you have a "snow-plough" somewhere on your farm. I'm very pleased it is working for you. Linda drives near an hour both ways on work days, and it has worked well enough. Maybe get a copy of an old book, "Cottage economy" by William Cobbett. he was an acetic old fudge, but also knew his stuff. Tells you what to grow and how to keep the pig on a very small acreage. Very clever really. It was written I think in the 1820's but still applies. Rambling style, and throws fits when he gets talking about government!..............but he Can tell you what to plant between your cabbages to get 2 crops a year! LOL! Pukka, that sounds like an interesting book. I will have to look for it. 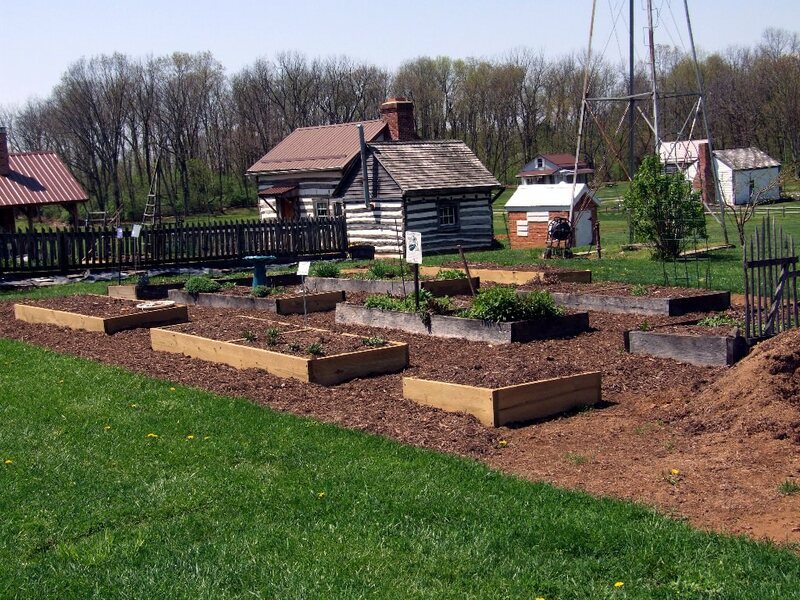 The local Hysterical society round here has a working replica of a typical Colonial era farm. You'd be amazed what you can grow easily on a small cultivated plot. 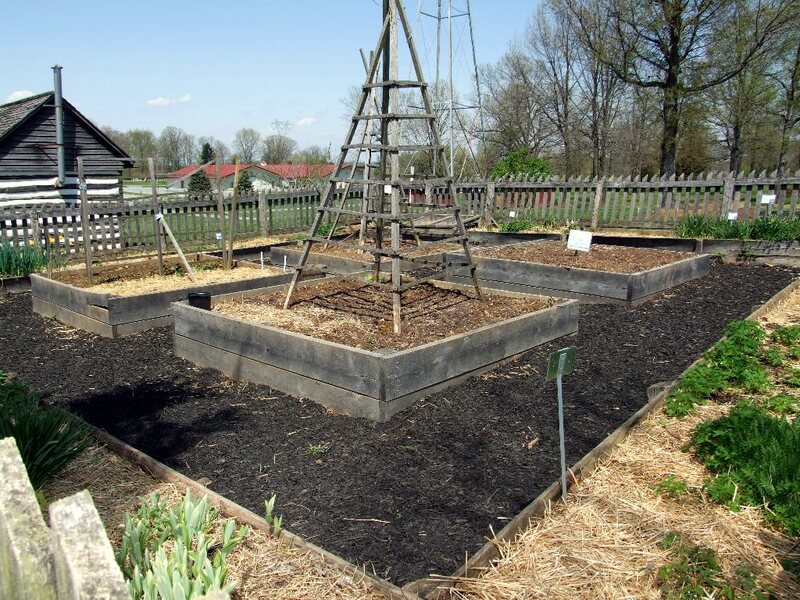 Its a technique called "4-square gardening" IIRC Its 4 raised beds with a path between them (no stooping to work the ground) a surrounding outside path then a white picket fence. 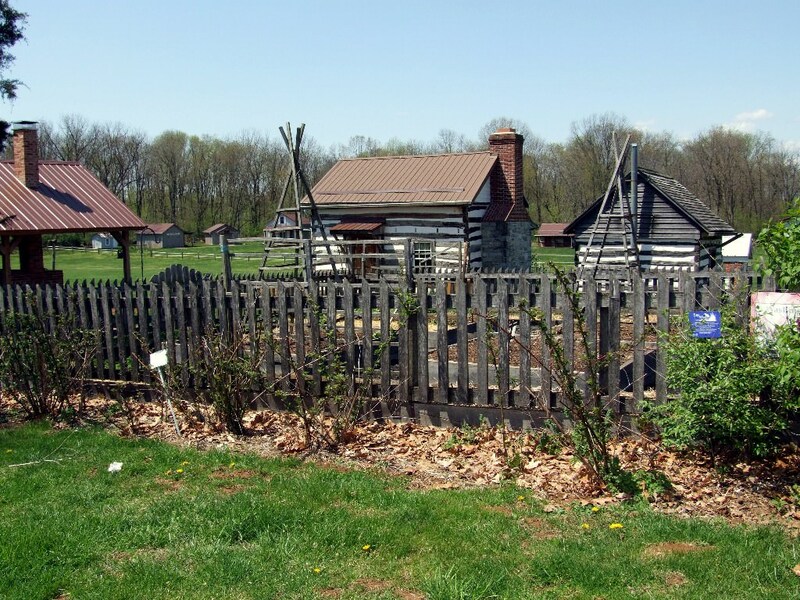 Its actually the origin of the white picket fence! I started moving this weekend. While I was out I snapped a pic with my phone. The place looks rough right now with the dry grass and all but it does spruce up a bit in the spring. Nice, enjoy it. Is the shed/barn part of it as well? Everything in the picture is my property. 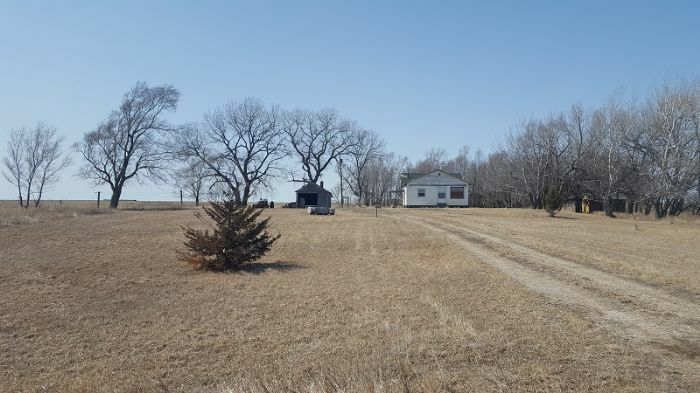 Total of 6 acres on the corner of the section. Once I get settled I will get my camera out to take some better pictures. Hey-is that Washington State I see in the background distance? Bear methinks you need some ,yard art, in the form of old semi derelict farm trucks and old cars......very nice property I envy you! I am pretty excited but I did have my first surprise. The tank on the toilet broke. There wasn't any heat in the house this winter and even though everything was drained the cold was too much for the porcelain on the toilet. So that will be my first thing to replace now. Looks like you have a great place there Bear. You'll probably learn the extra skill's for plumbing and building repairs as you go. That's what I've found over the last 12 years since we bought our house. It is about 200 years old; so lot's to do. Hopefully it will be finished this year! The budget for work is restricted when your still paying for the property. My advice is take your time and do the best job you can. But obviously start with the toilet!! Toilet? How many acres you got? I live in town and my wife is still trying to get me from going around the corner bush to pee! Heck, I was thinking about putting up an outhouse for emergencies! Do yourself a favor, based on horrible experience, get a new wax ring anyway! I do plan to do so. Years ago my grandfather was replacing a toilet and as I watched he said to always replace the wax ring. Never trust how it looks, just replace it. I figure he must have learned that the hard way. Wax gasket. Best $10 investment you'll have. When fixing wiring, as mentioned, use the breaker. I'm guilty of just using the switch, but got nailed once with a three way switch I forgot about! My place is still not finished; but we've done quite a lot. The wife is very handy with a cement mixer; which is useful. But her real job title is "Inspector of unfinished works"! always pointing out faults before the jobs done!! Here's a few before and after shot's . Our workshop rebuild. 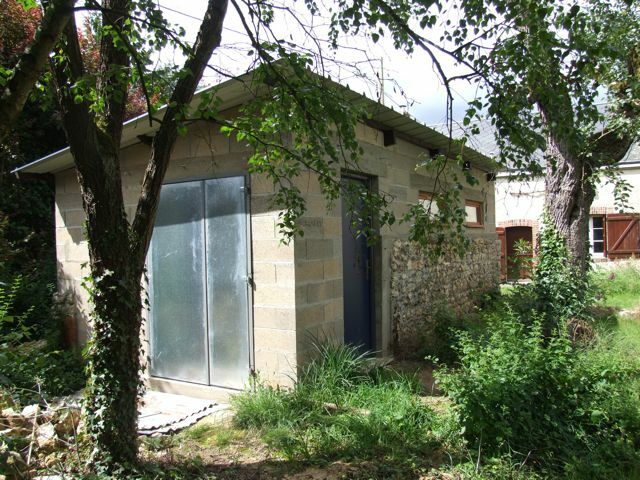 I was quoted 33,000 Euros by a local firm to renovate it. We did it ourselves for 3,000 Euros. 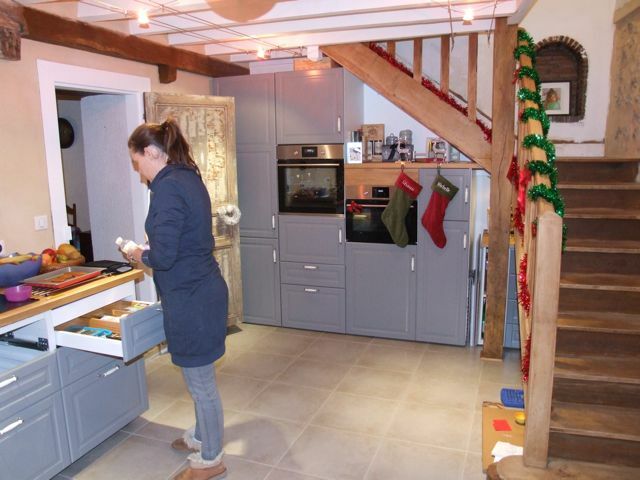 And the kitchen: Demolition and then almost completed for Christmas 2015. There's still more to do; but we're getting there! Nice pictures, Zed! Quite a difference in cost in doing things yourself. I can handle most things or I have friends that can handle what I can't so I am hoping to keep costs down my taking advantage of that. The supplies usually aren't bad, it's those labor prices that get a person.